A camera that can take 360 sphere pictures and videos has two fish-eye objectives that capture more than a half of the sphere each. To put those two "half" sphere pictures together at real-time before storing them on their memory the necessary processor power is not available.Therefore the two raw circle pictures are added into a standard jpg picture. This picture can then later e.g. 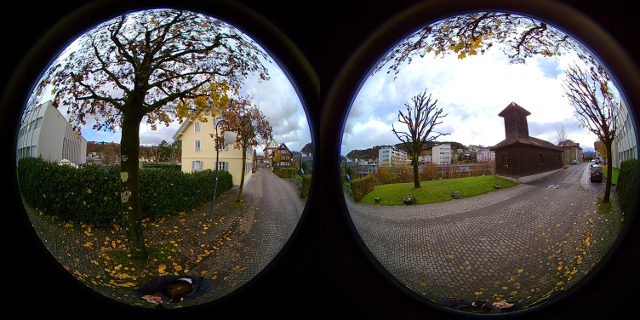 by an android app converted in a stitch picture containing both pictures and converted to a rectangular projection. Meta data should then be added to let the viewer SW to be know that it is not a regular jpg picture (the same applies also for videos). 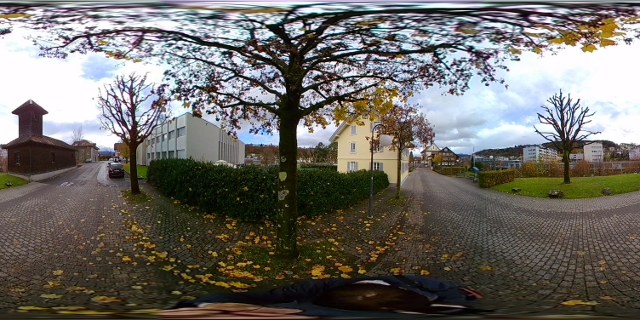 Google uses the MIME type application/vnd.google.panorama360+jpg to let it know that it is a 360 degree picture. Any picture viewer or movie player can be used. More specialized viewers could be installed. But there is also Web support for it as https://pannellum.org/ simply copy and past the web pages and modify them to point to your pictures and movies. The open it in a browser. Additional features as adding hot spots are supported and nothing has to be installed. If it is more frequently used than the used java scripts and the html pages should be installed on a web server. When adding hot spots their pitch and yaw must be known. panellum allows to pass "hotSpotDebug": true, to is viewer. then mouse clicks write the corresponding pitch and yaw into the browsers console. For Firefox the console can be seen when adding the Firebug plug in. vpx support must be compiled with ffmpeg and libvpx must be istalled. In Gentoo Linux this is done by setting the vpx useflag.